Ammonites are a group of extinct cephalopod mollusks with ribbed spiral shells. They are unusually diverse and well known among fossil lovers. Régis Chirat, researcher at the Laboratoire de Géologie de Lyon: Terre, Planètes et Environnement (CNRS/Université Claude Bernard Lyon 1/ENS de Lyon), and two colleagues from the Mathematical Institute at the University of Oxford have established the first biomechanical model explaining how these shells form and why they are so diverse. 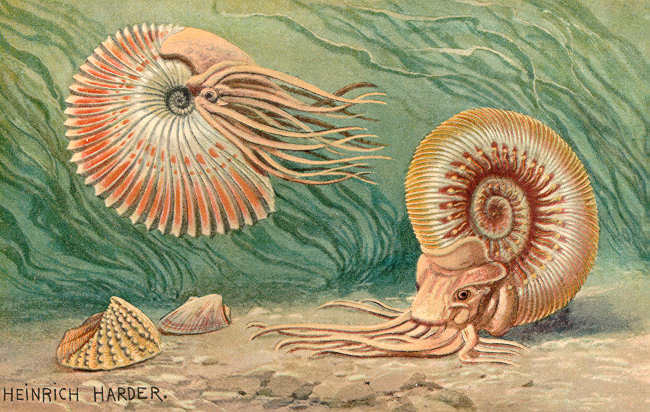 Their approach provides new paths for interpreting the evolution of ammonites and nautili, their smooth-shelled distant “cousins” that still occupy the Indian and Pacific oceans. This work has just been published on the website of the Journal of Theoretical Biology. The shape of living organisms evolves over a long period of time. The questions raised by this transformation have led to the emergence of theories of evolution. In order to research how biological shapes alter over a geological time scale, researchers have recently begun to investigate how they are generated during an individual’s development and growth; this is known as morphogenesis. Due to an exceptional diversity of their shell shapes and patterns (particularly the ribs), ammonites have been widely studied from the point of view of evolution but the mechanisms underlying the coiled spirals were unknown until now. Researchers therefore attempted to elucidate the evolution of these shapes without knowing how they had emerged. Régis Chirat and his team have developed a model that explains the morphogenesis of these shells. By using mathematical equations to describe how the shell is secreted by ammonite and grows, they have demonstrated the existence of mechanical forces specific to developing mollusks. These forces are dependent upon the physical properties of the biological tissues and on the geometry of the shell. They cause mechanical oscillations at the edge of the shell that create ribs, a sort of ornamental pattern on the spiral. Through examining various fossil specimens in light of the simulations produced by the model, the researchers observed that the latter could predict the number and shape of ribs in several ammonites. The model displays that the ornamentation of the shell evolves as a function of variables such as tissue elasticity and shell expansion rate (the rate at which the diameter of the opening increases with each spiral coil). By providing a biophysical explanation for how these ornaments form, this theoretical approach explains the diversity existing within and between species. It thus opens new perspectives for the study of the morphological evolution of ammonites, which appears to be largely governed by mechanical and geometric constraints. This new tool unveils new information on an old mystery. For almost 200 million years, the shells of nautili, distant “cousins” of ammonites, have remained essentially smooth and free of distinctive ornamentation. The model shows that having maintained this shell shape does not mean that nautili- incorrectly referred to as “living fossils”- have not evolved, but this is due to a high expansion rate, leading to the formation of smooth shells that are difficult to distinguish from one another. More generally, this work highlights the value of studying the physical bases of biological development: understanding the “construction rules” underlying the morphological diversity of organisms makes it possible to partially predict how their shape evolves.